A girl in a straw hat is standing in a sunflower field and is holding a toy mill in the hands against the sunset. Decorative wooden mill in woman's hand close up. A woman rotates the blades of a mill at sunset in a wheat field. Harvest concept, agriculture, farming. A girl holds in her hands a toy mill in a wheat field on a background of a sunset. 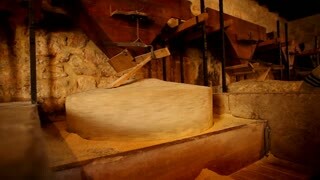 Old rustic wooden flour mill making white flour. Small production water mill. 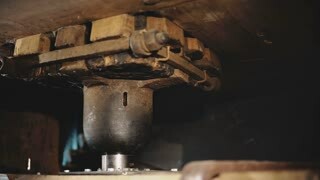 Close-up of grinding mechanism with two millstones which grind wheat into flour inside a traditional windmill in Holland, Zaanse Schans. Toy windmill in the hand of a young girl against a wheat field background. The concept of harvesting. Toy windmill in the hand of a young girl at sunset. The mill rotates at a slower rate. The concept of harvesting.